Forecast was for clouds and snow showers but we had blue sky all day! We decided to return to Taggert Lake to re-take the photos of yesterday and then carry on to neighbouring Bradley Lake. We used snowshoes and easily covered the ground. I used a Satmap gps with detailed topo mapping to keep us on track. The section down to Bradley Lake was quite steep but otherwise it was easy. 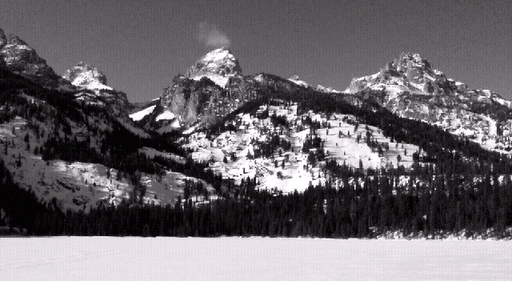 Lots of photos of the close-by main Tetons. Excellent light all day. Used orange filters a lot but also dark yellow when I was concerned about making the dark green conifers too dark. Even managed some picket fencing and shadows near the car. Another great day for taking photos. Dave, that looks fabulous. Sounds like a great trip. Enjoy!